Hudspeth’s demolition expertise and state-of-the-art equipment allow us to offer unique solutions to even the most challenging projects and to carry out those solutions efficiently, saving time and money. Our commitment to safety and open communication provides you with the assurance that your demolition project will be successfully executed with a focus on environmental issues, public safety and health risks, employee safety hazards and recycling processes. Hudspeth was contracted to perform demolition of the existing east wing on the hospital in preparation for construction of the new wing. As part of the project, Hudspeth crews worked to separate the approximately 15,000 sq. ft, 2-story east wing from the west wing and garage. The complex process involved an air gap process separating the two structures as well as intricate timber shoring which allowed Hudspeth crews to safely demolish the structure. Additional support was also required in order to secure the 83 foot long sloped peak roof from the center during demolition. Yeshiva Toras Chaim is an existing school building with an attached synagogue and social hall. 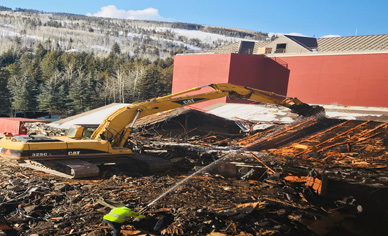 Hudspeth was contract to perform asbestos abatement and demolition of the synagogue in preparation for renovation to the existing building and a dormitory addition for the school. The project required asbestos abatement in order for the replacement of the heat supplied by the Base Central Heat Plant (CHP) and High Temperature Hot Water (HTHW) distribution system which included installing individual boilers at multiple facilities. 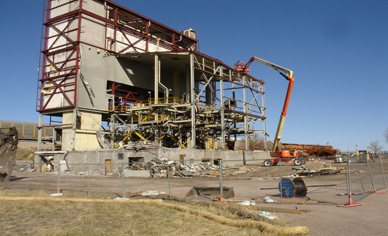 In addition, Hudspeth was hired to demolish the heat plant (Building 660) structure and all of the associated utilities. The structure had two major segments to the building, one portion was 110’ high and the other was 60’ high. The overall square footage of the plant was 70,000 square feet. 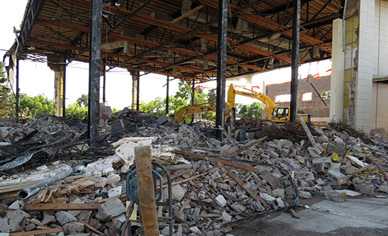 The Former Wazee Union project site located at 3501 Wazee is a two (2) story, vacant warehouse constructed of steel beams and cinder block that was last used as multiple art studios. Hudspeth was contracted for the removal of regulated asbestos containing materials (RACM’s) and the demolition of the 20,000 sq ft building. 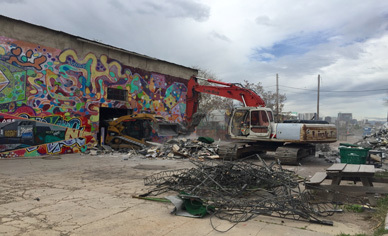 Due to the structural challeges of the building, Hudspeth worked with the structural engineer, third party industrial hygienist, the client and Colorado Department of Public Health and Environment (CDPHE) to devolp a plan to successfully remove the building safely via an open air demolition.